A truck, part of a convoy, carrying military pickup trucks with machine guns attached is seen on the outskirts of the village of Sugedigi, Turkey, Jan. 21, 2018. Turkish forces shelled northern Syria on Monday, pressing a campaign to push Kurdish militia out of the Afrin area, while officials said the operation will be over quickly. The Kurdish militia YPG also reported clashes Monday with Turkish forces northwest of Afrin. Turkish Deputy Prime Minister Mehmet Simsek said in addition to being brief, the military offensive would serve to reduce Turkey's terror risk. Ankara accuses YPG, which controls Afrin, of being linked to an insurgency inside Turkey. The militia is a key ally of Turkey’s U.S. NATO partner in its war against the Islamic State group. Turkish Prime Minister Binali Yildirim says the objective of the operation, called Olive Branch, is to establish a 30-kilometer security cordon inside the Afrin area to protect Turkish towns from attacks. Yildirim claimed a rocket attack Saturday on the Turkish border town of Kilis underscored the need for the cordon. During the attack, two houses and a workplace were hit, and one person was slightly wounded. On Sunday, another border town — Reyhanli — was reportedly hit by rockets. 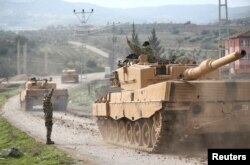 Turkish media also reported that Turkish soldiers had clashed with Kurdish militia forces three kilometers inside Syria. The YPG claimed it had repelled a Turkish attack. No casualty figures have been released. A Turkish military convoy arrives at a village on the Turkish-Syrian border in Kilis province, Turkey, Jan. 21, 2018. Turkish President Recep Tayyip Erdogan, speaking to thousands of supporters in the city of Bursa Sunday, claimed the operation was proceeding successfully. "Our jets took off and started bombing. And now, the ground operation is under way. Now, we see how the YPG ... are fleeing in Afrin," Erdogan said. "We will chase them. God willing, we will complete this operation very quickly." Ankara appears to be expediting the operation as it faces growing diplomatic pushback. U.S. Secretary of State Rex Tillerson urged Turkey to "exercise restraint" and avoid killing or injuring civilians. His comments came in phone conversations with his Russian and Turkish counterparts on Saturday. He said Turkey's "legitimate security concerns" must be addressed and urged officials to remain focused on the goal of defeating IS. On Sunday, Paris announced it was calling for an emergency meeting of the United Nations Security Council. "Ghouta, Idlib, Afrin — France asks for an urgent meeting of the Security Council," wrote French Foreign Minister Yves Le Drian on Twitter. He also said he had spoken Sunday with his Turkish counterpart, Mevlut Cavusoglu. "This fighting ... must stop," said French Defense Minister Florence Parly on France 3 television Sunday, warning that the Turkish offensive could interfere in the war against IS. The pushback by France may have surprised Ankara, according to political columnist Semih Idiz of the Al Monitor website. 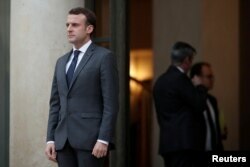 He noted French President Emmanuel Macron recently hosted his Turkish counterpart in Paris in a meeting heralded in Ankara as the defining of new relationship with France. French President Emmanuel Macron accompanies a guest after a meeting at the Elysee Palace in Paris, Jan. 12, 2018. Macron is again establishing himself as a world leader, said political columnist Cengiz Aktar. He said if the Security Council views these actions as a threat to peace, it could put Turkey "in a very difficult position and unsustainable position." Aktar says with France being likely viewed as neutral by the other security members, it would enhance the chances of the success in any vote. But other analyst played down the significance of any U.N. Security Council meeting. "There will be a balanced approach. I don’t think there will be direct targeting of Turkey by name," says Idiz. "Even if the pressure is applied, the juggernaut has started rolling. You can't put the toothpaste back in the tube." France’s move comes amid growing numbers of images purportedly of civilian casualties from Turkish fire. "As always, the PKK/YPG terrorists continue to deceive the world with nonsense propaganda and baseless lies by showing neutralized terrorists as civilians," Cavusoglu tweeted. Erdogan is continuing to rally support within Turkey for the operation, touring the country and addressing large public rallies. The speeches condemn the YPG Kurdish militia and describe the operation in heavy nationalist rhetoric as a battle for the future of the nation. Erdogan also criticizes Washington. Analysts say both play well with his nationalist sentiments but also mark a key point in relations between NATO allies. Turkey's President Tayyip Erdogan addresses members of parliament from his ruling AK Party during a meeting at the Turkish parliament in Ankara, Turkey, January 16, 2018. "The vast population is behind him. He is openly challenging the United States. He has "crossed the Rubicon" and "won't be able to go back now [past U.S.-Turkish relations)," warned Aktar. He adds, "there is a kind of national pride, which is very, very strong." Because of that, Aktar says "we can safely say Mr. Erdogan will win all the coming elections." In 2019, Turkey faces local, general and presidential elections. Speculation is growing the polls might be brought forward to 2018. The CHP Party, the country's main opposition, has strongly backed the military operation. "We wish that this operation achieves success and reaches its goal as soon as possible," said Bulent Tezcan, CHP deputy chairman. … We hope the Turkish Armed Forces will reach its target without any injury or loss and return home safely. May God help our army and our soldiers." The country’s second-largest opposition party, the pro-Kurdish HDP, finds itself as the only mainstream party opposing the operation — a stance that is putting the party under growing pressure. 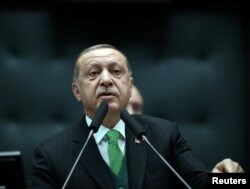 At a rally Sunday, Erdogan warned: "HDP calls for demonstrations against the Afrin campaign. Do not go out to the square. Those who come out of the square will pay a heavy price." The party's co-leaders are already in jail on terrorism charges, along with thousands of its officials. There have been few demonstrations against the Afrin military operation in Turkey. An attempted protest in central Istanbul was quickly broken up by police Sunday with a series of arrests, and journalists were warned not to film the incident. VOA Kurdish Service stringer Newroz Resho contributed to this report.